Just when you thought you’ve seen it all in Boracay, a new resort with a spunky branding and interiors meant to out-Instagram the rest of the island comes: COAST Boracay, the Raintree Group’s latest concept. Indeed, from the moment its opening day was announced last year on social media, we couldn’t contain our excitement. After all, if you have dined in any of Raintree’s restaurants in Manila, you will know that this hospitality empire not only boasts of chic spaces and great food, but also consistently good service. Imagine bringing all that into a hotel—I could almost picture a perfect vacation. From the same folks that brought us Providore, Chotto Matte, Stella/Rocketroom, and Chelsea Café, COAST Boracay is a 71-room boutique resort nestled in the infamous party island. Right at the middle of Station 2 in White Beach, COAST is the striking beach “newcomer” set to redefine the Boracay experience. 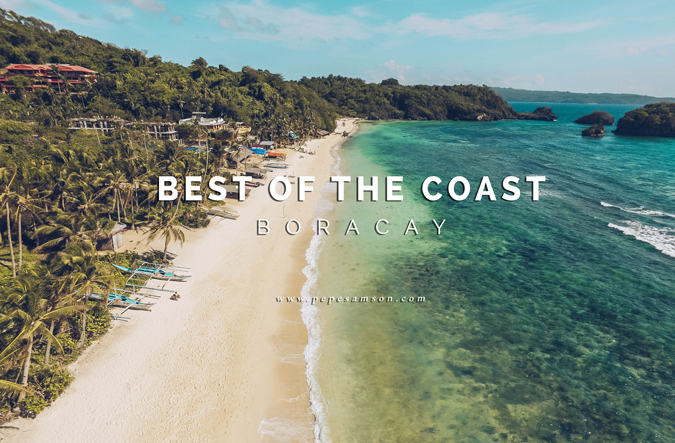 The resort was our official hotel partner for the recently-concluded Best of the Coast Boracay, and we chose it not only because it’s Number 1 in Trip Advisor, but also because friends highly recommend it. Having stayed there myself, I can attest to the fact that this resort is nothing short of awesome. 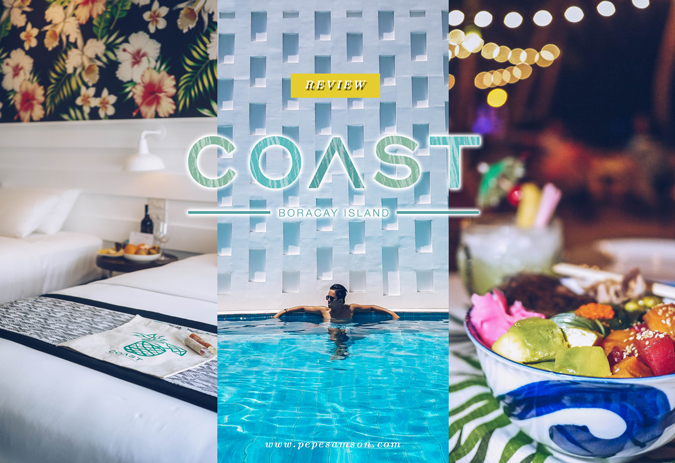 With an exciting in-house restaurant, amazing staff, lovely rooms, and a relaxing vibe all around, COAST is definitely a must-check-out (or rather "in"?) when planning a Boracay trip. The full review that follows will further show you why. COAST staff takes guest comfort seriously. From the moment you step out of the airport to the moment you check out of the hotel, you can be sure that someone is efficiently assisting you. Booking a room includes land and boat transfers (Caticlan): from the airport, COAST staff will pick you up and drive you to the Fairways and Bluewater port, where a private speedboat awaits. The boat ride takes about 5 minutes, and once in the island, it takes about 15 minutes to get to the resort. Upon arriving, we were handed welcome drinks, cold face towels, and shell necklaces. I sipped on my drink and just admired the place as I waited for my keycard. COAST is indeed beautiful, with a modern tropical feel peppered with Filipino touches. Striking pieces were everywhere. Every corner spelled F-U-N. The people were warm. This was going to be an amazing vacation. COAST’s 71 rooms snuggle the center swimming pools—positioned in a U shape, giving guests views of calming whites and blues all day. We stayed in a Premier Room (26 sqm., check rates), which features two twin beds, an en suite bathroom, a mini-bar, a desk, and a SMART LED TV. All elements echo the soothing white, black, and turquoise tones, and impart a sense of minimalism. Subdued chic, as I would like to call it. A floral wall installation pops out from the otherwise neutral room. By the door are floor-to-ceiling windows with roll-up blinds. Welcome treats awaited us upon arrival: complimentary hand spray, cologne, slippers, and an eco bag (perfect for strolling around the beach; for Premier Rooms and up only) plus a bottle of wine, fruits, and cheese. The SMART TV also had a welcome message flashed on it when we entered, making us feel like true VIPs. The Sealy beds are of five-star quality—I slept so well for the 2 nights I was there. Of course, after taking these photos, I jumped into my bed and enjoyed our wine (it was really good!) and cheese. Warning: this room will try to make you forget that the beach is just outside, so don’t succumb. Be strong. Sliding doors lead to the beautiful bathroom, equipped with a walk-in shower, a vanity area, and a toilet with bidet. There’s a ladder towel/clothes rack on one corner. Again, the minimalist and dominantly white theme is seen here. I loved the toiletries especially made for COAST—made mostly of coconut and passionfruit—all of which I gladly took home, thank you very much. No, I’m not ashamed to admit that I wanted to bring home the COAST experience. COAST is one of the few resorts in Boracay (or the ONLY resort?) to have SMART TVs in their rooms, but to be honest, I try not to watch TV when I’m on a trip. But they, this one has NETFLIX so catching up on an episode or two of your favorite show won’t hurt. Don’t worry about the munchies—the room comes with a well-stocked mini-bar. Cha Cha’s Beach Café, the resort’s all-day dining venue, offers a sumptuous and unique breakfast buffet and an a la carte menu that perfectly embodies the beach vibe. Its interiors is as vibrant as the rest of the premises—if not more; high ceilings, low-hanging lamps, quirky decors, and Filipino elements give a lot of character to the space. Anywhere you sit, you can get a glimpse of the pool, but if you want to watch the beach instead, go for the alfresco area, from which the bar is most accessible as well. The restaurant’s morning spread is unlike any other breakfast buffets I’ve tried—while there are the staples (bacon, eggs, waffles, pancakes, cereals, salads, fruits, yogurt, etc. ), it also features non-conventional items like Thai and Mediterranean dishes, for instance (must try). The breads, all made in-house, are delicious, and if you are looking for something extraordinary, I suggest you look for their signature Ube Champorado, which is, in one word, divine. 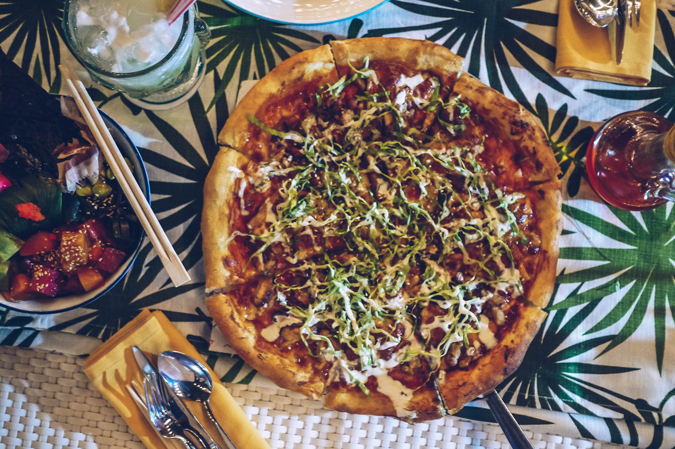 And while there are lots of restaurants around the area, Cha Cha’s a la carte menu is worth trying, even just for an afternoon snack or a late dinner. The Cold Spicy Salmon and Tuna Poke Bowl (PhP450) is my favorite—a bowl of fresh tuna and salmon, avocado, sesame seaweed, cucumber, salmon caviar, and Japanese pickles. Complete the beach experience and order the Cold Seafood Platter (PhP1,650), or the Mixed Plate Grill (PhP595) composed of pork belly, chicken satay, and butterflied shrimps. Don’t be surprised to find familiar dishes in the menu, as some of them came from the Manila Raintree establishments, with slight tweaks. For instance, there’s the Winner Winner Chicken Dinner (PhP350) people line up for in SM Aura (Providore). Flatbreads are also available (Stella), as well as cocktails from Chotto Matte. My drink of choice though is the Super Mango Shake (PhP220)—layers of fresh mangoes, coconut cream, condensed milk, whipped cream, and mango jelly! Cool down with a cocktail or beer, which the resort serves below zero. Happy Hour is from 3 to 8 PM, which means some drinks are half-priced! Two more dining outlets are set to open—a beach shack and a rooftop lounge. COAST has two swimming pools—one by the restaurant, with a sunken pool bar and another at the far end, which is more kid-friendly. Of course, I preferred staying in the one with the bar (LOL), where I can enjoy cold bottles of beer and fresh mango shakes while half-soaked in water. There are sun loungers and canopied seats around—the area was just so relaxing and perfect for … doing nothing. Make sure you stick around at 4PM—they serve free popcorn and ice cream to all guests in the pool area! On the second level, there’s a mini-gym with a few basic equipment and a function room that doubles as a private dining room. Downstairs, there’s Tala, another function room. Outside by the entrance is the Gift Shop, where guests or walk-ins can purchase souvenirs made locally—from beauty products and accessories to scarves, hats, and clothing. Seated outside on a warm summer evening, admiring the string of bulbs adorning coconut trees, I sip on my mango shake and pop another piece of poke into my mouth as soft Latin music plays. It seems like a dream, but the truth is that it’s just a scene straight from COAST—a Boracay vacation unlike any other. I really don’t know what I love most about the hotel. The pretty room? The tasty food? The relaxing pools? Or the little touches—like sweets delivered to my room before bedtime? Or perhaps the impeccable service, which makes leaving seem like a non-option. By the time the staff picked up our bags and assembled us to take us to the airport, I wasn’t in the mood to cooperate. In one year, COAST has managed to be the most-loved resort in Boracay, and in just two days, I understood why. COAST offers what many hotels of the same (and even higher) price point simply cannot: exquisite service, great amenities, fine food, and an overall vibe that begs you to stay. Stylish, comfortable, and well-designed rooms. Quality toiletries. NETFLIX. Staff is SUPERB: warm, genuinely friendly, helpful, attentive. Great, unique breakfast choices; a la carte menu is extensive. The hotel's fun, chic, and vibrant branding is felt everywhere. Centrally located in Station 2. Has its own beachfront. Outstanding. No doubt why it's currently Number 1. Have you been to COAST Boracay? Share your thoughts on the comments section below!